Creams and potions abound, claiming to get rid of its unsightly appearance, but few live up to their assertions. But what if a large part of the cure really begins on the inside of the body, rather than the outside? Most experts agree that the dimpled appearance of cellulite occurs due to problems/imbalance in the connective tissue and fat in a person’s body but there are many theories about what may cause this imbalance. It seems that hormones, diet, lifestyle and genetics all play a role but are not absolutes. 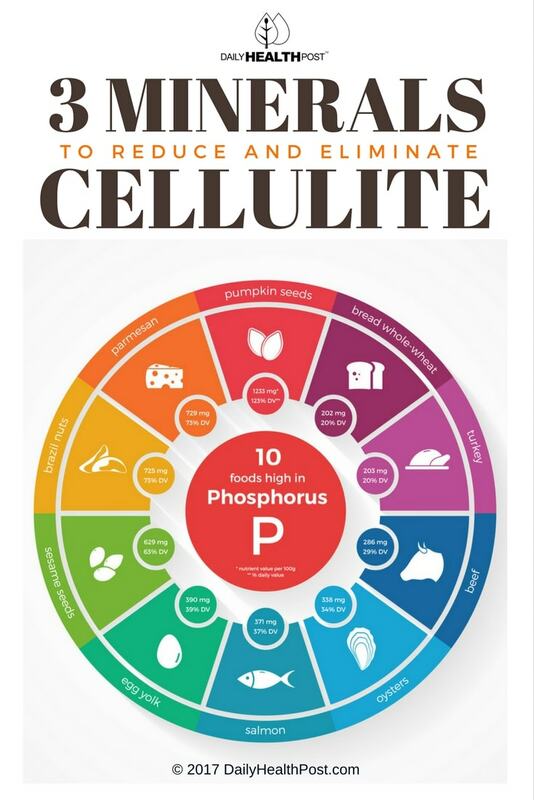 Phosphorus can help reduce cellulite because it aids in the healing and repair of tissues and cells. It also helps the body utilize and burn carbohydrates and fats and increases energy. Food sources include salmon, pork, beef, nuts, and pumpkin seeds. As an antioxidant, selenium helps the body to detoxify and also increases youthfulness of the skin. It also stimulates the thyroid gland, thereby increasing metabolism. Chicken, beef, pork, seafood, brazil nuts, and whole wheat bread are good sources of selenium. Like phosphorus, zinc is essential for the renewal of tissues and cells and has antioxidant properties. It also increases metabolism and aids the body in balancing blood sugar, which helps to burn fat. Zinc deficiency has been found to inhibit the formation of collagen, which is necessary for healthy skin. Zinc is found in seafood, spinach, wheat germ, lamb, beef, pumpkin seeds, and cashews. It’s important to remember that these minerals are just a part of an effective anti-cellulite nutrition program. If you really want to get rid of cellulite you will have to stick to the 3 basic foundations – A healthy detox diet, a lifestyle that will limit your exposure to toxins, and the perfect cellulite reducing exercises.